A black and white negative of the Whitby Lawn Bowling and Tennis Club. View is of members lawn bowling. The clubhouse at right was made from an old building moved from Centennial Park in 1931. 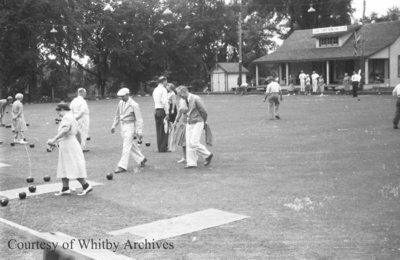 Whitby Lawn Bowling and Tennis Club c.1937, Marjorie Ruddy. Whitby Archives A2013_040_626C.